For the manufacturer, see Velcro. Hook-and-loop fasteners, hook-and-pile fasteners or touch fasteners (often referred to by the genericized trademark velcro, despite the objections of the Velcro Brand), consist of two components: typically, two lineal fabric strips (or, alternatively, round "dots" or squares) which are attached (sewn or otherwise adhered) to the opposing surfaces to be fastened. The first component features tiny hooks, the second features smaller loops. When the two are pressed together the hooks catch in the loops and the two pieces fasten or bind temporarily. When separated, by pulling or peeling the two surfaces apart, the strips make a distinctive "ripping" sound. 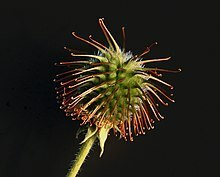 Tiny hooks can be seen covering the surface of this bur. The design of hook-and-loop imitated this natural mechanism for seed dispersion. The original hook-and-loop fastener was conceived in 1941 by Swiss engineer George de Mestral. The idea came to him one day after returning from a hunting trip with his dog in the Alps. He took a close look at the burs (seeds) of burdock that kept sticking to his clothes and his dog's fur. He examined them under a microscope, and noted their hundreds of "hooks" that caught on anything with a loop, such as clothing, animal fur, or hair. He saw the possibility of binding two materials reversibly in a simple fashion if he could figure out how to duplicate the hooks and loops. Hook-and-loop is viewed by some like Steven Vogel or Werner Nachtigall as a key example of inspiration from nature or the copying of nature's mechanisms (called bionics or biomimesis). Originally people refused to take De Mestral seriously when he took his idea to Lyon, which was then a center of weaving. He did manage to gain the help of one weaver, who made two cotton strips that worked. However, the cotton wore out quickly, so De Mestral turned to synthetic fibers. He settled on nylon as being the best synthetic, which had several advantages: it doesn’t break down, rot, or attract mold, and it could be produced in threads of various thickness. Nylon had only recently been invented, and through trial and error de Mestral eventually discovered that, when sewn under hot infrared light, nylon forms small hook shapes. However, he had yet to figure out a way to mechanize the process and to make the looped side. Next he found that nylon thread, when woven in loops and heat-treated, retains its shape and is resilient; however, the loops had to be cut in just the right spot so that they could be fastened and unfastened many times. On the verge of giving up, a new idea came to him. He bought a pair of shears and trimmed the tops off the loops, thus creating hooks that would match up perfectly with the loops in the pile. Mechanizing the process of weaving the hooks took eight years, and it took another year to create the loom that trimmed the loops after weaving them. In all, it took ten years to create a mechanized process that worked. De Mestral submitted his idea for a patent in Switzerland in 1951, which was granted in 1955. Within a few years he obtained patents and began to open shops in Germany, Switzerland, Great Britain, Sweden, Italy, the Netherlands, Belgium, and Canada. In 1957 he branched out to the textile center of Manchester, New Hampshire in the United States. Columnist Sylvia Porter made the first mention of the product in her column Your Money's Worth of August 25, 1958, writing, "It is with understandable enthusiasm that I give you today an exclusive report on this news: A 'zipperless zipper' has been invented – finally. The new fastening device is in many ways potentially more revolutionary than was the zipper a quarter-century ago." A Montreal firm, Velek, Ltd., acquired the exclusive right to market the product in North and South America, as well as in Japan, with American Velcro, Inc. of New Hampshire, and Velcro Sales of New York, marketing the "zipperless zipper" in the United States. De Mestral obtained patents in many countries right after inventing the fasteners, as he expected an immediate high demand. Partly due to its cosmetic appearance, though, hook-and-loop's integration into the textile industry took time. At the time, the fasteners looked like they had been made from leftover bits of cheap fabric, and thus was not sewn into clothing or used widely when it debuted in the early 1960s. It was also viewed as impractical. A number of Velcro Corporation products were displayed at a fashion show at the Waldorf-Astoria hotel in New York in 1959, and the fabric got its first break when it was used in the aerospace industry to help astronauts maneuver in and out of bulky space suits. However, this reinforced the view among the populace that hook-and-loop was something with very limited utilitarian uses. The next major use hook-and-loop saw was with skiers, who saw the similarities between their outerwear and that of the astronauts, and thus saw the advantages of a suit that was easier to don and remove. Scuba and marine gear followed soon after. Having seen astronauts storing food pouches on walls, children's clothing makers came on board. As touch fasteners only became widely used after NASA's adoption of it, NASA is popularly – and incorrectly – credited with its invention. By the mid-1960s hook-and-loop fasteners were used in the futuristic creations of fashion designers such as Pierre Cardin, André Courrèges and Paco Rabanne. Later improvements included strengthening the filament by adding polyester. In 1978 de Mestral's patent expired, prompting a flood of low-cost imitations from Taiwan, China and South Korea onto the market. Today, the trademark is the subject of more than 300 trademark registrations in over 159 countries. [specify] George de Mestral was inducted into the national inventors hall of fame for his invention. The big breakthrough George de Mestral made was to think about hook-and-eye closures on a greatly reduced scale. Hook-and-eye fasteners have been common for centuries, but what was new about hook-and-loop fasteners was the miniaturisation of the hooks and eyes. Shrinking the hooks led to the two other important differences. Firstly, instead of a single-file line of hooks, touch fasteners have a two-dimensional surface. This was needed, because in decreasing the size of the hooks, the strength was also unavoidably lessened, thus requiring more hooks for the same strength. The other difference is that hook-and-loop has indeterminate match-up between the hooks and eyes. With larger hook-and-eye fasteners, each hook has its own eye. On a scale as small as that of hook-and-loop fasteners, matching up each of these hooks with the corresponding eye is impractical, thus leading to the indeterminate matching. Hook-and-loop fastener photographed using a low power microscope. Various constructions and strengths are available. Some touch fasteners are strong enough that a two-inch square (5 × 5 cm) piece is enough to support a 175-pound (80 kg) load. Fasteners made of Teflon loops, polyester hooks, and glass backing are used in aerospace applications, e.g. on space shuttles. The strength of the bond depends on how well the hooks are embedded in the loops, how much surface area is in contact with the hooks, and the nature of the force pulling it apart. If hook-and-loop is used to bond two rigid surfaces, such as auto body panels and frame, the bond is particularly strong because any force pulling the pieces apart is spread evenly across all hooks. Also, any force pushing the pieces together is disproportionately applied to engaging more hooks and loops. Vibration can cause rigid pieces to improve their bond. Full-body hook-and-loop suits have been made that can hold a person to a suitably covered wall. When one or both of the pieces is flexible, e.g., a pocket flap, the pieces can be pulled apart with a peeling action that applies the force to relatively few hooks at a time. If a flexible piece is pulled in a direction parallel to the plane of the surface, then the force is spread evenly, as it is with rigid pieces. Increase the area of the bond, e.g. using larger pieces. Ensure that the force is applied parallel to the plane of the fastener surface, such as bending around a corner or pulley. Increase the number of hooks and loops per area unit. Shoe closures can resist a large force with only a small amount of hook-and-loop fasteners. This is because the strap is wrapped through a slot, halving the force on the bond by acting as a pulley system (thus gaining a mechanical advantage), and further absorbing some of the force in friction around the tight bend. This layout also ensures that the force is parallel to the strips. Touch fasteners are easy to use, safe, and maintenance free. There is only a minimal decline in effectiveness even after many fastenings and unfastenings. The tearing noise it makes can also be useful against pickpockets. There are also some deficiencies: it tends to accumulate hair, dust, and fur in its hooks after a few months of regular use. The loops can become elongated or broken after extended use. The hooks often become attached to articles of clothing, especially loosely woven items like sweaters. This clothing may be damaged when one attempts to remove the hook-and-loop, even if the sides are separated slowly. The tearing noise made by unfastening hook-and-loop fasteners make it inappropriate for some applications. For example, a soldier in hiding would not want to alert the enemy to his position by opening a pocket. It also absorbs moisture and perspiration when worn next to the skin, which means it will smell if not washed. Because their ease of use, hook-and-loop fasteners have been used for a wide variety of applications where a temporary bond is required. It is especially popular in clothing where it replaces buttons or zippers, and as a shoe fastener for children who have not yet learned to tie shoelaces. Touch fasteners are used in adaptive clothing, which is designed for people with physical disabilities, the elderly, and the infirm, who may experience difficulty dressing themselves due to an inability to manipulate closures such as buttons and zippers. Touch fasteners held together a human heart during the first artificial heart surgery, and it is used in nuclear power plants and army tanks to hold flashlights to walls. Cars use it to bond headliners, floor mats and speaker covers. It is used in the home when pleating draperies, holding carpets in place and attaching upholstery. It closes backpacks, briefcases and notebooks, secures pockets, and holds disposable diapers, and diaper covers for cloth diapers, on babies. It is an integral part of games such as tag rugby and flag football, and is used in surfboard leashes and orthopaedic braces. NASA makes significant use of touch fasteners. Each space shuttle flew equipped with ten thousand inches of a special fastener made of Teflon loops, polyester hooks, and glass backing. Touch fasteners are widely used, from the astronauts' suits, to anchoring equipment. In the near weightless conditions in orbit, hook-and-loop fasteners are used to temporarily hold objects and keep them from floating away. A patch is used inside astronauts' helmets where it serves as a nose scratcher. During mealtimes astronauts use trays that attach to their thighs using springs and fasteners. Touch fasteners are also used aboard the International Space Station. The Slidingly Engaging Fastener was developed to address several problems with common hook-and-loop fasteners. Heavy-duty variants (such as "Dual Lock" or "Duotec") feature mushroom-shaped stems on each face of the fastener, providing an audible snap when the two faces mate. A strong pressure sensitive adhesive bonds each component to its substrate. There is a silent version of touch fasteners, sometimes called Quiet Closures. Velcro jumping is a game where people wearing hook-covered suits take a running jump and hurl themselves as high as possible at a loop-covered wall. The wall is inflated, and looks similar to other inflatable structures. It is not necessarily completely covered in the material—often there will be vertical strips of hooks. Sometimes, instead of a running jump, people use a small trampoline. Television show host David Letterman immortalized this during the February 28, 1984 episode of Late Night with David Letterman on NBC. Letterman proved that with enough of the material a man could be hurled against a wall and stick, by performing this feat during the television broadcast. Jumping went beyond David Letterman, with amusement companies renting walls and jumpsuits for $400-$500 a day. It was also done on a regular basis in pubs in both New York and New Zealand, where it is a competition to see how high a person can get their feet above the ground. Jeremy Bayliss and Graeme Smith of the Cri Bar and Grill in Napier, New Zealand, started it after seeing American astronauts sticking to walls during space flights. They created their own equipment for the "human fly" contests, and sold it to several others in New Zealand. The game moved to the U.S. after Sports Illustrated published a story on it in 1991. Adam Powers and Stephen Wastell of the Perfect Tommy's bar in New York city read of the game, and soon became the United States distributor of Human Bar Fly equipment. By 1992, wall-jumping was practiced in dozens of New Zealand bars and was said to be one of the favorite bar activities there at the time. 1969–1972 - Velcro brand fasteners were used on the suits, sample collection bags, and lunar vehicles during all Apollo program missions to the Moon. 1984 - David Letterman wears a suit made of hook-and-loop and jumps from a trampoline into a wall covered in the product during an interview with Velcro Companies' USA director of industrial sales. 1996 - In the John Frankenheimer film The Island of Dr. Moreau, Moreau's assistant jokingly claims that the doctor won his Nobel Prize for inventing Velcro. 2002 - The Star Trek: Enterprise episode "Carbon Creek" portrays Velcro as being introduced to human society by Vulcans in 1957. One of the Vulcans in the episode is named "Mestral", after the fastener's actual inventor and founder of the brand. 2004 - One of the characters in the film Garden State made a vast fortune from inventing "silent Velcro". 2016 - As an April Fool's Day joke Lexus introduced "Variable Load Coupling Rear Orientation (V-LCRO)" seats, technology that attaches the driver to the seat with Velcro Brand product to allow for more aggressive turns. ^ a b c d e Stephens, Thomas (2007-01-04). "How a Swiss invention hooked the world". swissinfo.ch. Retrieved 2008-05-09. ^ McSweeney, Thomas J.; Stephanie Raha (August 1999). Better to Light One Candle: The Christophers' Three Minutes a Day: Millennial Edition. Continuum International Publishing Group. p. 55. ISBN 978-0-8264-1162-4. Retrieved 2008-05-09. ^ a b "About us: History". Velcro.us. Retrieved 2013-11-13. ^ a b c d e f g h Strauss, Steven D. (December 2001). The Big Idea: How Business Innovators Get Great Ideas to Market. Kaplan Business. pp. 15-pp.18. ISBN 978-0-7931-4837-0. Retrieved 2008-05-09. ^ Steven Vogel (1988). Life's Devices: The Physical World of Animals and Plants. ISBN 978-0-691-02418-9. ^ a b c d e f Schwarcz, Joseph A. (October 2003). Dr. Joe & What You Didn't Know: 99 Fascinating Questions About the Chemistry of Everyday Life. Ecw Press. p. 178. ISBN 978-1-55022-577-8. Retrieved 2008-05-09. But not every Velcro application has worked ... A strap-on device for impotent men also flopped. ^ a b c d Freeman, Allyn; Bob Golden (September 1997). Why Didn't I Think of That: Bizarre Origins of Ingenious Inventions We Couldn't Live Without. Wiley. pp. 99-pp.104. ISBN 978-0-471-16511-8. Retrieved 2008-05-09. ^ a b Jones, Thomas; Benson, Michael (January 2002). The Complete Idiot's Guide to NASA. Alpha. pp. 130–132. ISBN 978-0-02-864282-6. Retrieved 2008-05-09. ^ Jane Pavitt (2008-09-01). Fear and fashion in the Cold War. Victoria & Albert Museum. ISBN 978-1-85177-544-6. ^ a b Weber, Robert John (February 1993). Forks, Phonographs, and Hot Air Balloons: A Field Guide to Inventive Thinking. Oxford University Press. pp. 157–160. ISBN 978-0-19-506402-5. Retrieved 2008-05-09. ^ Jones, Thomas; Michael Benson (January 2002). The Complete Idiot's Guide to NASA. Alpha. p. 18. ISBN 978-0-02-864282-6. Retrieved 2008-05-09. ^ Mone, Gregory (2007-05-14). "Invention awards The New Velcro". Popular Science. Archived from the original on 2010-01-17. Retrieved 2008-05-10. ^ Body Beauty (2007-06-11). "Velcro Reinvented". InventorSpot.com. Archived from the original on 2010-01-17. Retrieved 2008-05-10. ^ a b c Sennett, Frank (November 2004). 101 Stunts for Principals to Inspire Student Achievement. Corwin Press. p. 86. ISBN 076198836X. Retrieved 2008-05-09. ^ a b c Kleinfield, N. R. (1992-01-05). "Fly Through Air, Hit a Wall. Now Stay There". New York Times. Retrieved 2008-05-12. ^ "Working on the Moon". Retrieved 16 May 2016. ^ "LiveScience: Who Invented Velcro?". Retrieved 16 May 2016. ^ Maslin, Janet (1996-08-23). "The Island of Dr. Moreau (1996)". The New York Times. Retrieved 2008-05-11. ^ Tatara, Paul (1997-07-04). "'Men in Black:' DO believe the hype". CNN. Retrieved 2008-05-11. ^ "Startrek.com:Carbon Creek". Startrek.com. CBS Studios. Retrieved 2008-05-11. ^ Holden, Stephen (2004-07-28). "Garden State (2004)". New York Times. Retrieved 2008-05-11. ^ "TIME: Best April Fools Day Jokes". Retrieved 16 May 2016.